If you answer “yes” to the following questions, you are ready to become part of the volunteer team at the Virginia Department of Game and Inland Fisheries! Do you want to give back to Virginia’s wildlife and fisheries resources? Do you enjoy new challenges and want to share your interests with others? Help our conservation police officers, biologists, and other professional staff at VDGIF fulfill our mission to manage the Commonwealth’s wildlife and inland fish resources, promote safety, and provide opportunities for all to enjoy wildlife, fish, boating and related outdoor recreation. We now have opportunities for the public to join us as volunteers in our new Complementary Work Force Program. If you are interested in devoting your time and talents, you can apply here, or contact our Volunteer Administrator via email at CWFVolunteers@dgif.virginia.gov. Apply to Become a CWF Volunteer! Boating Safety Education volunteers are committed to training Virginia boaters to be safe and knowledgeable on Virginia’s waters. Many are well seasoned boaters and want to “give something back.” If this describes you, apply here or contact us via email: BoatSafety@dgif.virginia.gov to obtain information on upcoming instructor training opportunities. The Virginia Master Naturalist Program is a statewide corps of volunteers providing education, outreach, and service dedicated to the beneficial management of natural resources and natural areas within their communities. Interested Virginians become Master Naturalists through training and volunteer service. 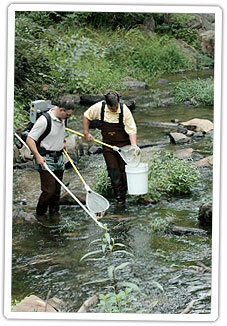 The process for becoming a certified Virginia Master Naturalist typically takes 6 to 12 months. One starts by completing a 40-hour basic training course offered by a local chapter of the program. An additional 8 hours of advanced training is also required. An important part of the certification process is the required 40 hours of volunteer service annually. All service projects must be approved by the chapter, meet the mission of the program, and be of public benefit rather than personal gain. Volunteer opportunities range from education-related outreach to data collection and citizen-science projects to more labor-intensive stewardship efforts. Those interested in becoming a Master Naturalist, can check the program web site: virginiamasternaturalist.org for more information and click on the “Chapters” link for the location of existing chapters. Questions should be directed to the VMN program office, masternaturalist@vt.edu, 434-872-4587.